Beautiful Incentives: Harmful and Irritating chemicals in #makeup that you should avoid. 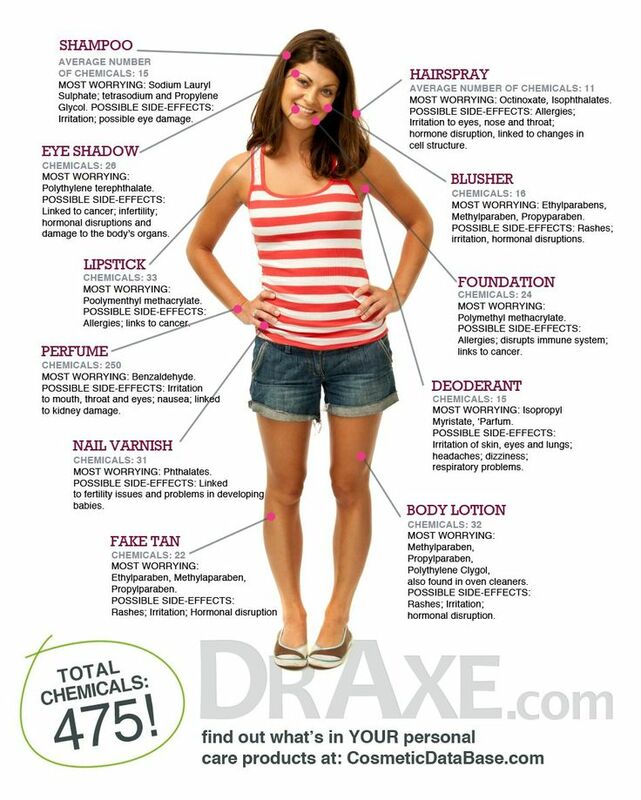 Harmful and Irritating chemicals in #makeup that you should avoid. 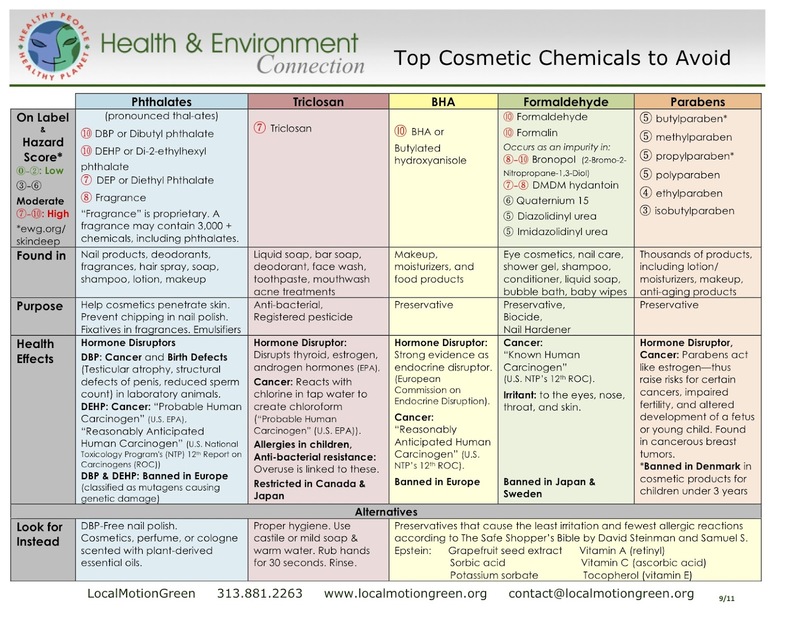 I try to stay away from all harmful chemicals in makeup and skin care, including parabens. Parabens are considered the most questionable, especially when concerning the development of breast cancer. You can google more on that. The studies leave too much up in the air, but the bottom line is that a lot of parabens sunk into the pores of women's breasts and were found in the tissue of many who were tested that were undergoing treatment for breast cancer. It is your choice, but with that information, I try hard to stay away from anything with many parabens. Of course, you will find many differing views, but a little proof is enough for me to be much more cautious. I will on occasion use products with them, because of costs and the low budget I am on, but I have cut my use dramatically. You know the deodorant myth about aluminum being harmful? Nothing has been significantly proven! It is the parabens in your deodorant you should be more worried about! The more you know, right folks? Knowledge is your strongest weapon, use it. Just as important, I try to stay away from all makeup and skin care ingredients that will aggravate my ongoing cystic acne. It took me a while to learn the worst offenders for my type of acne. 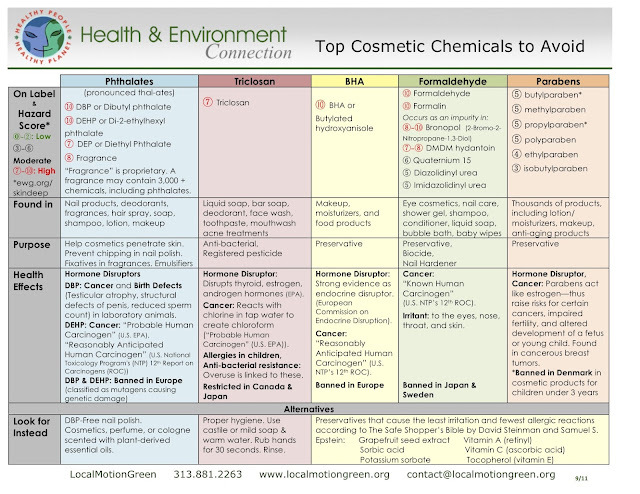 Here is a long list of very valuable information I have collected on harmful chemicals. BHA---This one i thought was good for us. A healthy way to exfoliate? Triclosan-BIG nono-hormone disruptor-carcinogenic. Hidden as "anti-microbial" and other alias's. Commonly found in hand washes, household products, clothing, and cosmetics. Deemed worse than initially thought a few years ago. It is in the process of being banned by certain companies, after a lot of pressure from consumers. UPDATE! Lots of companies have banned the use of Triclosan! Mineral oil - This is a biggie I have noticed. I will break out right away when this stuff gets on me. This is in shampoo to and I have broken out ALOT from using it! Laureth 4 and 23 - I notice this in shampoos I have used that broke me out, especially in my scalp and back! Helpful article on choosing your mineral makeup. Skin Deep - Look up and find out about what's in your makeup. Do research before you go to the store. Find the harmful chemicals and possible causes to your rosacea, acne, dermatitis and other skin issues. It could very well be in the product you use. Beauty Brains Learn about the chemicals in the makeup, hair, and skin products you use every day, straight from a chemist's brain first hand. You'd be surprised at how many proclaimed "natural" ingredients are more harmful or no better than man made chemicals. Knowledge is power. 5 Common Skin Myths By: Paula Begoun Ok, i have to forwarn you, I do value a lot of this woman's info. She is pretty much a cosmetic guru, BUT do not take everything she says to heart. She discusses parabens and what she considers weak studies. You have to take conflicting information and make your best judgement. As i said, it is all controversial. I am giving you views from different perspectives, and different people. A lot of studies only suggest toxin, with little evidence and some with a lot. I personally try to stay away from parabens. The world of beauty can indeed be beautiful, but all too often the information you get is anything but beautiful—actually, it can be downright ugly! Sometimes the advertising and sales pitches you read and hear are minor distortions of facts or borderline deceptive; in other cases, they are out-and-out lies. Whether this information comes from a physician or from a well-intentioned website, the Paula's Choice Research Team spends a lot of time untangling the insanity to help you get to the truth. Below we present five beauty lies that many people believe. Perhaps you have come across this information in a magazine or online, or heard it from your doctor, a friend, or a family member. No matter how you got this misinformation or where you heard these lies, we're here to set the record straight—to give you the most up-to-date, reliable information so you can take the best possible care of your skin! Knowledge is beautiful! Lie #1: Dry skin? Drink more water! The truth: We see this tip all the time, and wish it were true; after all, it doesn't get much easier than just drinking water! But, have you ever met someone who said that their dry skin went away from drinking lots of water? It doesn't happen. The truth is dry skin isn't about water consumption. If all it took to get rid of dry skin was drinking more water, then no one would have dry skin, and companies would stop selling moisturizers—and we all know that's not the case! The causes of and treatments for dry skin are far more complicated than just drinking water; plus, drinking more water than your body needs will only result in more trips to the bathroom. Read more about how to treat dry skin. Lie #2: You can repair damaged hair. The truth: Countless hair-care products, including hair masks and so-called "deep" conditioners, make claims of repairing hair, as if all the damaging things we do to it (coloring, straightening, brushing, sun exposure) can be mended by using these types of products. The truth is hair is dead. Period. It's dead, which is why it doesn't hurt when you get your hair cut. Given that it's dead, it cannot be repaired or permanently revert to its normal state. You can no more mend a hair strand than you can mend a dead leaf or soften a rock. What does happen when you use good conditioners and good styling products is that your damaged hair can feel smoother and softer and it can look shinier and more healthy, but it's not repaired. These products provide only a temporary fix—if you don't keep using them, you hair will go back to looking and feeling damaged. If a hair-care product could truly repair your hair, you'd need to use it only a few times and then you'd be done, but clearly that isn't what happens! Lie #3: There's a product that can get rid of cellulite. The truth: The 85% of women who have cellulite would love it if this were true (all of us here at Paula's Choice would, too), but, alas, it's just one more falsehood. The cosmetics industry, and lots of doctors and aestheticians, want to sell you products and/or provide treatments (especially expensive ones) claiming to slim, trim, tone, and de-bump your thighs, but if any of those worked, who would have cellulite? Trying to navigate and separate cellulite facts from fiction isn't easy, but there is a bit of positive news. There are a few options, such as some lasers and retinoids, that may make a difference, but even these treatments, which do have some potential for working (and we mean only the "potential" for working; it's not a sure thing) rarely live up to the claims asserted. Still, a bit of improvement, as opposed to merely wasting your money, is definitely a turn for the better! Read moreabout what you can do to improve (but, sadly, not get rid of) cellulite. Lie #4: One special ingredient (like vitamin C or peptides) is all aging skin needs. The truth: Given the advertising, it would seem that most cosmetics companies believe this is true—that one ingredient alone can do it all—because they perpetually launch products with one showcased ingredient, be it plant stem cells, a special melon extract from the south of France, or a plant oil from Morocco. Although there are lots of special ingredients that are great for skin (and hair), the truth is that giving your skin what it needs to act younger and be more healthy is far more complex than providing it with one ingredient, no matter how good it is. Skin is the body's largest organ and it needs an array of beneficial ingredients to protect and repair itself from environmental assaults and the effects of aging. Looking for skin-care products with one superstar ingredient cheats your skin of the range of ingredients it needs to significantly improve. Think of it like your diet: Vegetables are nutritional powerhouses, but if you eat only vegetables, you soon will be malnourished because veggies alone don't provide everything the body needs to maintain itself and stay healthy. Check out some of our favorite products with a range of beneficial ingredients proven to help skin look and act younger. More favorites can be found on Beautypedia. Lie #5: Parabens are bad for you, so avoid products that contain them. The truth: The "parabens = bad" myth is so pervasive that many people have opted to take a better-safe-than-sorry approach. We can't say we blame you for being cautious, but make sure your decision is based on facts, not on media-fueled misinformation. As it turns out, parabens are actually some of the gentlest preservatives used in cosmetics. Parabens may come in the form of butylparaben, ethylparaben, isobutylparaben, methylparaben, or propylparaben. They've been linked distantly (meaning in limited studies on only a handful of subjects or in animal studies) to breast cancer due to their weak estrogenic activity and their presence in a tiny number of breast cancer tissue samples. That cancer connection, however remote, has some people worried. The truth is: There is no research proving parabens should be avoided when shopping for personal-care products, for yourself or for your family, at least no more so than avoiding plants that have estrogenic activity. According to published research and global cosmetics regulatory organizations, from the United States and Canada to Europe and Asia, parabens, especially in the small amounts present in personal-care products, are not a problem. According to these studies (and assuming the parabens get into the body), parabens are "fully metabolized before they enter the blood stream," which is more than can be said for some plant extracts with estrogenic activity, but no one is trying to scare you into avoiding plants. In a review of the research into the estrogenic activity of parabens, the study's author concluded that based on maximum daily exposure estimates, "it was impossible that parabens could increase the risk associated with exposure to estrogenic chemicals." Although more cosmetics companies have opted to avoid parabens, those who continue to preserve their products with them are not making a mistake. Parabens are among the most effective (and safest) preservatives around. Indeed, their undeserved reputation has left many cosmetics chemists scrambling to find equally effective options. Read more about the paraben controversy here! I own an old edition of her "Don't go to the cosmetics counter without me". In terms of avoiding irritating ingredients and over priced highends, It has been a pretty helpful reference over the years. She does recommend very good high end dupes.